In a deleted scene from The Lord of the Rings: The Return of the King, Saruman is murdered by his acolyte, Grima Wormtongue, who sneaks up behind his former master and brutally stabs him in the back several times. Behind the scenes, director Peter Jackson was working with Christopher Lee and Brad Dourif to make the shot play out exactly as he intended. Not quite feeling like he was getting the performance he wanted, Jackson went up to Lee and explained at length how he thought the legendary performer should act when Wormtongue’s knife plunges into his back. But this was not just any actor he was speaking to. 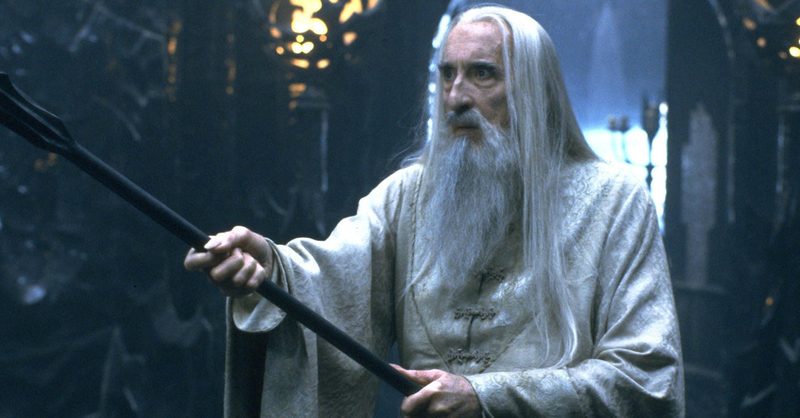 This was Christopher Lee, seasoned solider and spy. The man who’d volunteered to fight in the Winter War in Finland at the outset of World War II. The man who’d foiled mutinies as a member of RAF intelligence. Who worked for the “Ministry of Ungentlemanly Warfare” rounding up war criminals in the war’s aftermath. While Jackson’s vision had created one of the most beloved film trilogies of all time, this was one instance where he was a little out of his depth. Born to an English lieutenant colonel and an Italian countess in 1922, Lee was educated in some of England’s finest schools, but he felt his first real call to action when World War II broke out in 1939. After briefly traveling to Finland to volunteer his help as the Scandinavian country sought to repel Soviet invaders, he later signed up to join the RAF and become a fighter pilot. However, it was not meant to be, as Lee suffered from blurred vision and painful headaches during a training flight, disqualifying him from the training program. His dreams of being a fighter pilot were dashed, but Lee wasn’t discouraged. Convinced he needed to do something “constructive,” he signed up to join RAF intelligence, and his career as a spy began. Thanks in part to the fact that he spoke five languages fluently and could get by in three others, Lee was perfectly suited to spy work, and he continued to serve throughout the rest of the conflict. When the War was over, he was sent to work with the Central Registry of War Criminals and Security Suspects, where he was tasked with tracking down Nazi war criminals. It was during this time that he witnessed the unspeakable nightmare of the German concentration camps. 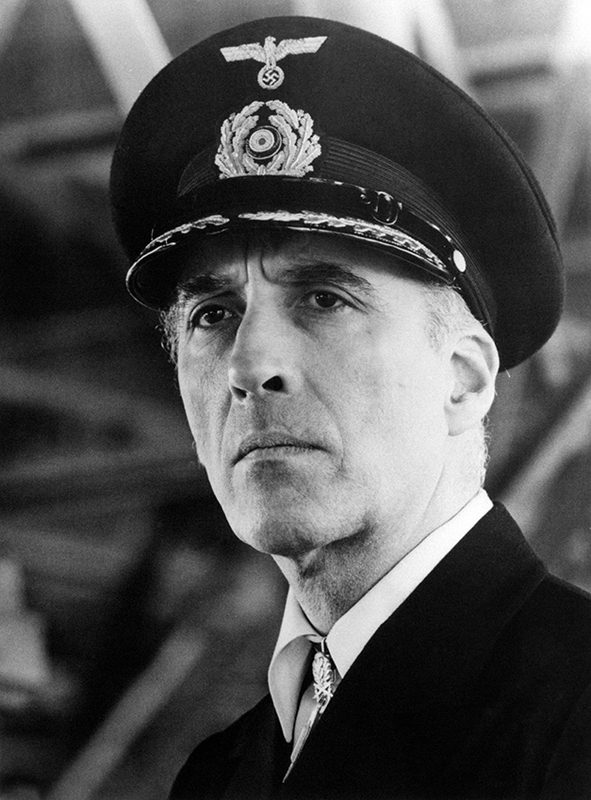 Role reversal: In 1979, Lee played a Third Reich captain in the film 1941. By now, it was 1945, and Lee’s military service was coming to a close. In his words: “When the Second World War finished I was 23 and already I had seen enough horror to last me a lifetime.” When he returned home, he was offered a job at the pharmaceutical company he’d worked for before enlisting. The pay would have been good, but as he put it: “I couldn’t think myself back into the office frame of mind.” Not surprising, given what he’d seen, but what else could he do? One day, while dining with his cousin, Lee was explaining his various war wounds in explicit detail when his cousin had a thought: “Why don’t you become an actor, Christopher?” A life with so much drama seemed perfectly suited for the craft, and Lee jumped at the idea. And that’s how this remarkable man went from interrogating war criminals to gracing the silver screen. Lee was not raised on the stage. He lived an entire life before the thought of becoming a professional actor even crossed his mind. Perhaps that’s why he was no ordinary actor. He first made his name playing monsters in a series of B-movies made by Hammer Film Productions. 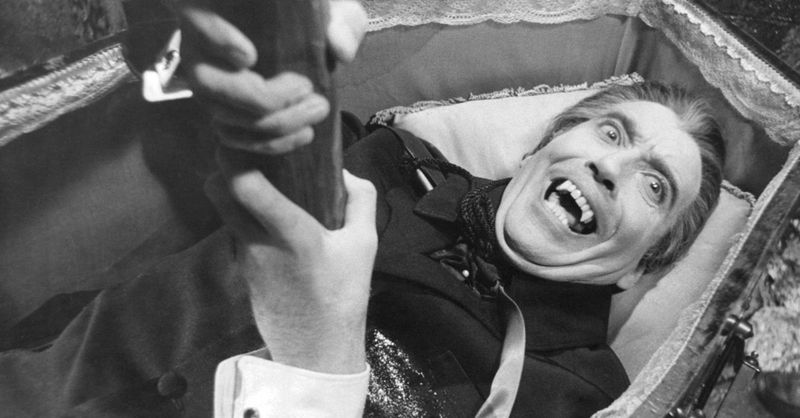 His first Hammer role was as Frankenstein’s Monster, but he became far more famous playing Dracula. To this day, when countless people all over the world picture the legendary vampire, they picture Lee. Lee would end up playing Dracula ten times. It was good, steady work, but he eventually got sick of being typecast. It likely didn’t help that he wasn’t exactly given the best material to work with: in the 1965 film Dracula: Prince of Darkness, Lee doesn’t speak a single line in the entire film, only communicating through menacing hisses. 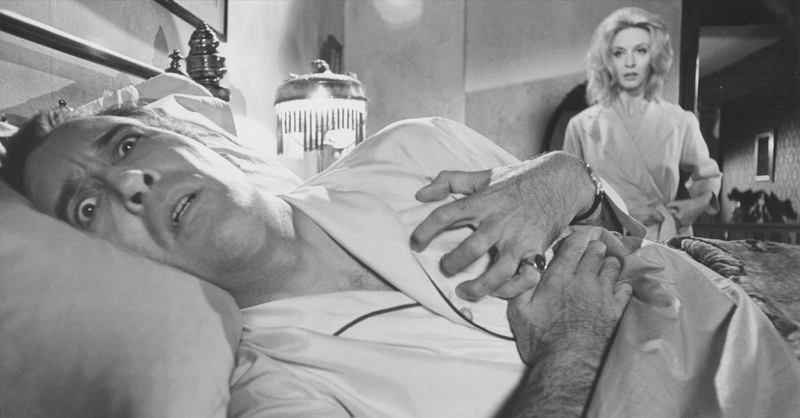 Allegedly, Dracula was given full dialogue in the movie, but Lee thought it was so poorly written that he only agreed to remain on the project if he didn’t have to speak. While many think of him as Dracula, Lee actually had a remarkably varied and prolific career that saw him touch such famous series as James Bond and Star Wars. In fact, in 2008, the Guinness Book of World Records recognized him as the single most connected actor in the world. Along the lines of the famous “Six Degrees of Kevin Bacon” game, it takes only an average of 2.5 steps to connect Lee to any other actor in Hollywood. This one-time spy seemed to have a knack for the craft. It was near the end of this long and storied career that Lee got the chance to join yet another iconic film series. Amongst all of the actors in the Lord of the Rings movies, Lee was likely the biggest fan of J.R.R. Tolkien’s fantasy epic. He reread the books almost every single year for his entire adult life, and he was the only member of the cast to have had the privilege of meeting Tolkien in person. It was actually Lee’s dream to play Gandalf. The grey wizard was Lee’s favorite fictional character, and he helped inspire Lee’s lifelong fascination with magic and the occult. Unfortunately, he was thought to be too old for the role when filming actually began, and it went to Ian McKellan instead—believe-it-or-not, McKellan is 17 years younger than Lee. 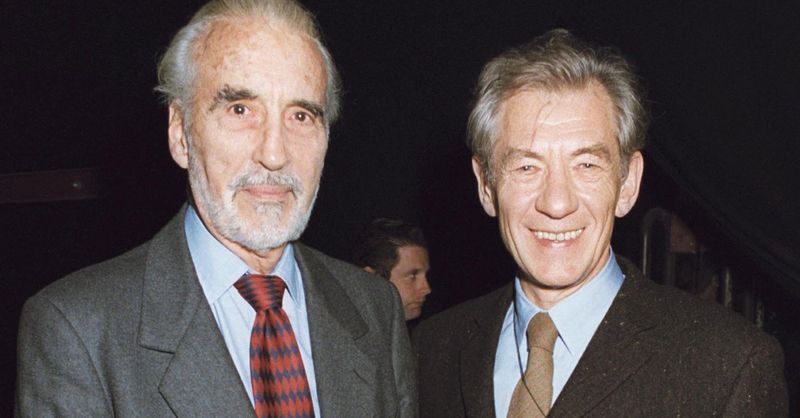 Thankfully, Gandalf isn’t Middle-earth’s only wizard, and Lee was cast as Saruman instead—Jackson remembers Lee’s casting as a breeze, because he didn’t need to explain the character in the slightest. Lee already had an encyclopedic knowledge of Tolkien’s world. So when Jackson had the audacity to tell this man how to act when getting stabbed, Lee simply turned to him and dryly said “Have you any idea what kind of noise happens when somebody’s stabbed in the back? Because I do.” He then proceeded to enlighten Jackson as to his personal experience with such matters, and the director, wisely, decided to step back and let him act as he saw fit. 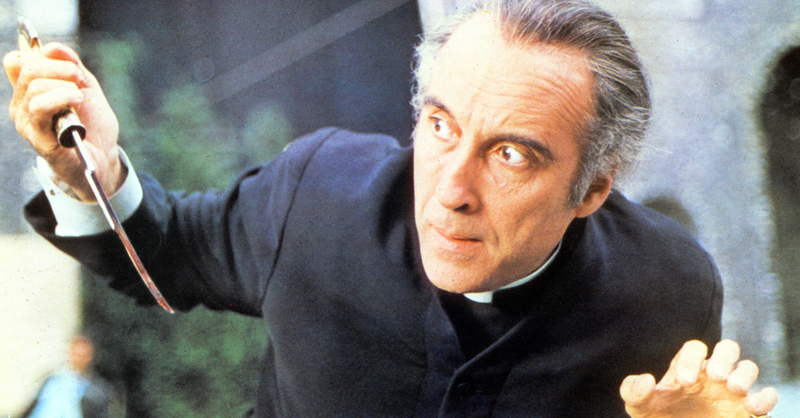 People picture a lot of different things when they think of Christopher Lee. Maybe they think of Saruman, or maybe Dracula. Maybe Count Dooku, or Francisco Scaramanga. But while he’s played some of the most iconic villains in film history, the man’s real life was more exciting than any movie. We didn’t even have time to mention how he witnessed the last ever public execution by guillotine in France as a young man. Or how he caught malaria six times in a single year during the war. Or how he released a heavy metal album about his legendary ancestor Charlemagne on his 90th birthday. There simply isn’t enough time to talk about every remarkable detail of the man’s life.